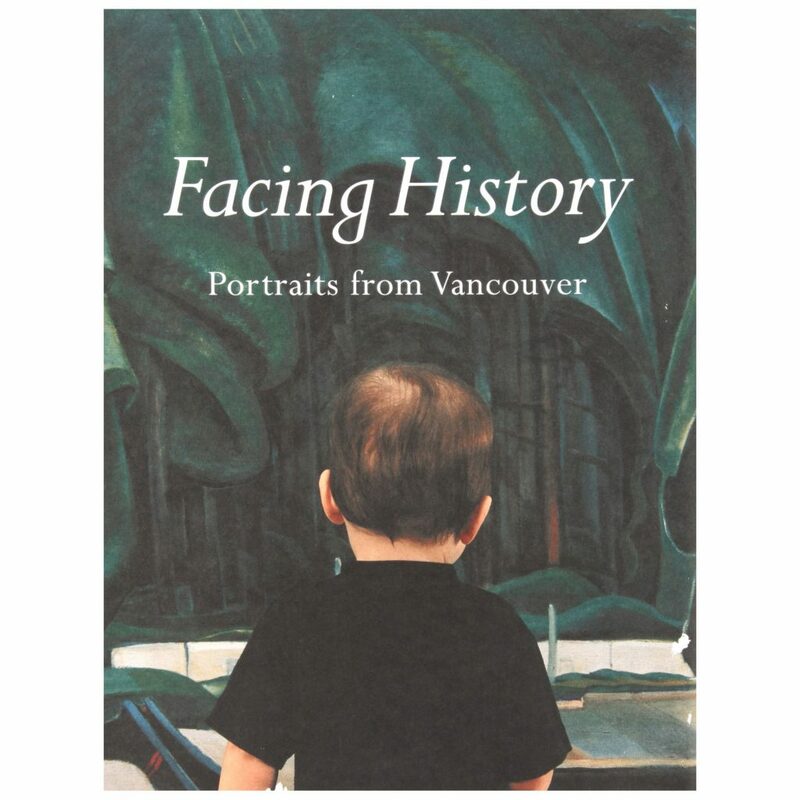 Facing History will provide a selective portrait of people living in Vancouver from 1950 to 2001, represented by the work of many artists (primarily Vancouverites) who work with photography and video art. It will have several components: a huge ‘salon style’ exhibition in the gallery, filling the walls with a range of photo series and video projects; four mini-billboards by contemporary artists installed at the Seabus Terminals on both sides of the Burrard Inlet; a large billboard at Georgia and Homer Streets (beside the Vancouver Public Library); and a community project inviting all PHG members to submit portraits of themselves which they believe to be ‘true’ to their personality, for use in a giant ‘portrait of the community’ poster/mailer. Included are photographs by Foncie Pulice, who took some 20 million street portraits in downtown Vancouver, from 1946 to 1979, using a camera made of war surplus materials and powered by a car battery; Ian Wallace’s studies for his My Heroes in the Streets project (1986); Robert Minden’s photographs of the community of Steveston; black and white portraits by Chick Rice; N.E. 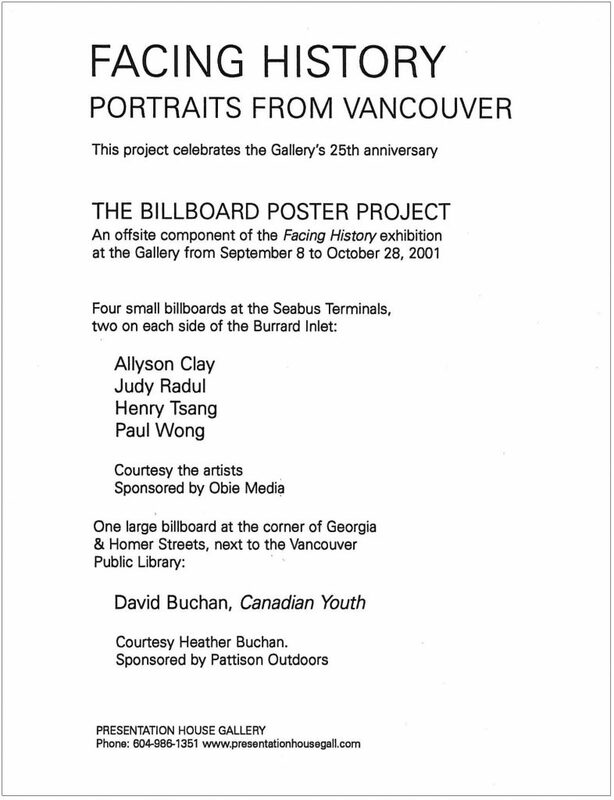 Thing Co.’s People/Language project (1977), which brought together people with surnames that are also common nouns, verbs and adjectives; Kyla Mallett’s Legendary Teens series, portraits taken at Tsawwassen’s White Spot restaurant; and the 110 portraits in Jochen Gerz’s project Reasons for Smiles, created by asking individuals to take a self-portrait with the following instructions: “Simply think of something that makes you smile”. A catalogue in conjunction with the exhibition was co-published by Presentation House Gallery and Arsenal Pulp Press. Saturday, September 8th, 2 – 5 pm | Opening Reception with artists in attendance, presentations by Karen Love and John O’Brian. A celebration of the Gallery’s 25th anniversary. An open house for families which includes hands-on activities exploring self-portraiture and photography. Join fine art conservator Rebecca Pavitt to examine the different types of photographic prints and negatives likely to be found in family archives and discover the best ways to handle, preserve and display them. Study daguerreotypes, tintypes, albumen and silver-gelatin prints and a sampling of different color prints. Admission is free. Pre-registration is recommended. A graduate of the prestigious Arts Conservation program at Buffalo State College, Cooperstown New York, Rebecca Pavitt has worked as a Fine Arts Conservator in Vancouver since 1988. She specializes in artistic and historical works on paper and textiles. Vancouver artist, singer, and performance artist Carol Sawyer will give a short presentation on the work of Natalie Brettschneider. Since 1998, Sawyer has been reconstructing the activities of Brettschneider, a 20th century avant garde singer and performance artist. Part of Art Hop, a Canadian Art Magazine and Globe and Mail event which includes visits to the Vancouver Art Gallery, Presentation House Gallery and other galleries. FREE. 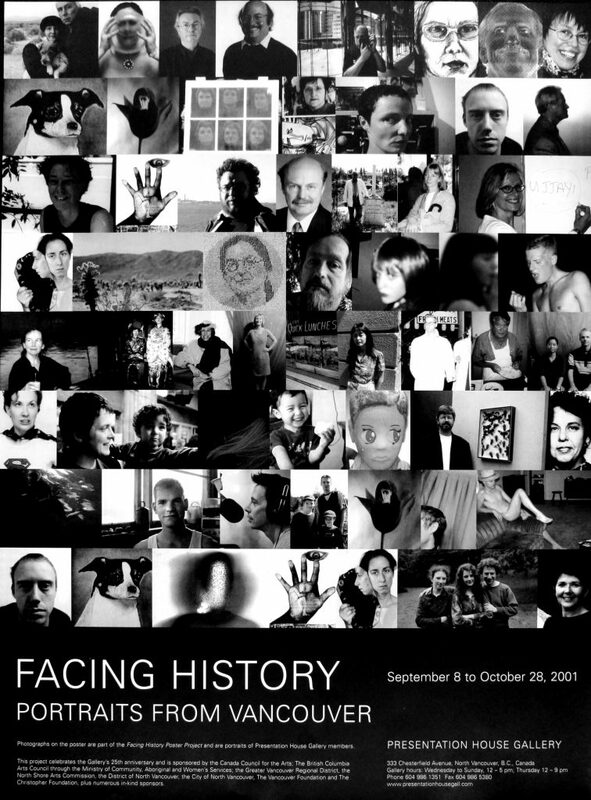 Poster for the exhibition "Facing History: Portraits from Vancouver"
Originally an exhibition at Presentation House Gallery in North Vancouver during September and October of 2001, Facing History–Portraits from Vancouver is a book about a city'­s inhabitants. Contemporary and archival photographs and art, made over the last 50 years by 55 image-makers, address the themes of family and the construction of identity; questions of attribution; the street; work and play; public life; art and life; the body and the life of the mind. Curated by Karen Love. With an essay by Bob Sherrin, and short texts by numerous writers. Alvin Armstrong, Glenn Baglo, Doug Ball, Marian Penner Bancroft, Percy Bentley/Dominion Photo Company, Natalie Brettschneider, David Buchan, Allyson Clay, Corrine Corry, Kate Craig, Bill Cunningham, Max Dean, Fred Douglas, Diane Evans, Jochen Gerz & Esther Shalev-Gerz, John Helcermanas, Lee Holt, Art Jones/Artray, Brian Kent, Robert Keziere, Roy Kiyooka, Una Knox, Mike Love, Elizabeth MacKenzie, Arnaud Maggs, Kyla Mallett, John McGinnis, Al McWilliams, Robert Minden, Al Neil, N.E. Thing Co Ltd., Wendy Oberlander, Ann Park, Jerry Pethick, Colin Price, Foncie Pulice, Judy Radul, Chick Rice, Henri Robideau, Carol Sawyer, Sandra Semchuk & James Nicholas, George Smith, Michele Smith, Henry Tsang, Jeff Wall, Ian Wallace, Colette Whiten, Paul Wong, Jin-me Yoon, Sharyn Yuen.